Another exciting lecture entitled “The Law of Averages Says” by Roger Hance FRPS. 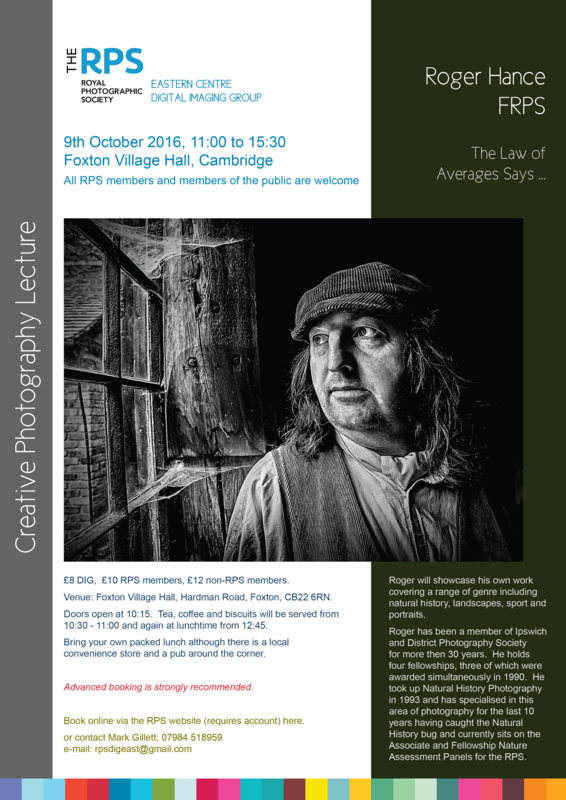 Roger will showcase his own work covering a range of genre including natural history, landscapes, sport and portraits. Roger holds four fellowships, three of which were awarded simultaneously in 1990. Roger took up Natural History Photography in 1993 and has specialised in this area of photography for the last 10 years having caught the Natural History bug and currently sits on the Associate and Fellowship Nature Assessment Panels for the RPS. He has been a member of Ipswich and District Photography Society for more then 30 years. Tickets are £12 for non-RPS members, £10 for members, £8.00 for RPS DIG members. Get details of the event and book on-line (requires an account) from the RPS website directly here, or to reserve your place, either e-mail rpsdigeast@gmail.com or call Mark Gillet on 07984 518959.